Q1 2017 – Welcome to Year Three! Q1 meetings were held in February for all three groups. Our chapter has grown to 325 members located across the Valley of the Sun. While Ahwatukee and Scottsdale have been gathering for over two years, our West Valley group met for its first donation meeting. We look forward to growing this group and contributing to even more local charities. A BIG THANK YOU to our media sponsors, Foothills Living and North Scottsdale Pulse for featuring our chapter in their January editions. Click on their names to read the articles! 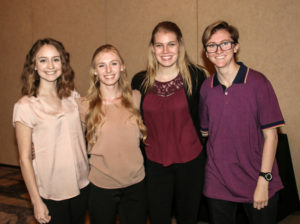 The Ahwatukee Foothills News also published a great article on our chapter in February! Growing our chapter is always first and foremost on our mind. We now have the help of two AMAZING marketing sponsors – Charissa McCarron of High Light Marketing and Elisa Lane of the Elen Sparks Agency. Corporate sponsorships provide us with the necessary funds to cover our administrative costs and donate 100% of our donations to the selected nonprofits. 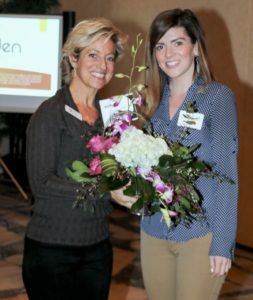 We welcomed two new corporate sponsorships this quarter – Conscious Connections and Vanessa Shaw, along with a renewal from Next Door Realty. If you are interested in sponsorship opportunities, please contact us. Lohman Company shared important tax strategies with our members and guests; just in time for your tax return prep! A big THANK YOU goes out to our event photographers as well. 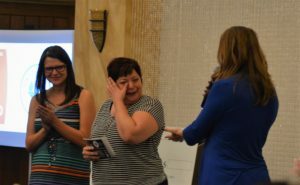 Stephanie Fry of Geek Eyed Designs and Colleen Katz of Pictures in Pixels generously donate their time and services to ensure we capture all of the incredible moments at our meetings. Singleton Moms was the Q4 recipient of our Ahwatukee donations. Alma Henriques, Care Team Specialist, brought a special guest with her to address our members and friends. Desiree, a single mom who batted late stage ovarian cancer, shared her journey with us and the impact this charity had on her family’s life. View her touching story here. Get the tissues ready. Meagan Kukowski, Executive Director of Girls on the Run Serving Maricopa County, was thrilled to announce they were launching their largest season to date with over 830 girls participating in their programs. Our Scottsdale members helped make that possible! GOTR awarded 50 scholarships to girls in need as a result of our member’s generosity. As a special treat, Meagan brought another Meagan with her. Meagan #2 is a junior at Cactus Shadows High School and participated in GOTR’s programs six times throughout her elementary school years. Today, she leads her life based around community all because of the lessons she learned through GOTR. Listen to her story here. 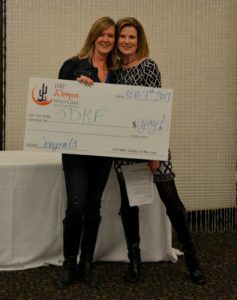 JDRF – Desert Southwest Chapter – Peggy Schapler spoke about the charity’s mission to turn Type 1 diabetes into Type None. Her son, Davis, was diagnosed with T1D when he was two. 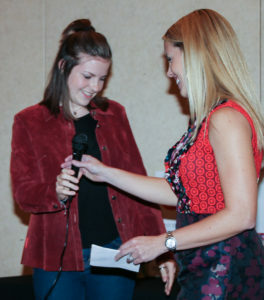 She described how a donation from our chapter would send local children living with T1D to a special camp that exists specifically to support and benefit them. Children who attend camp gain an immense amount of self-confidence while building valuable friendships with other children living with type 1 diabetes. 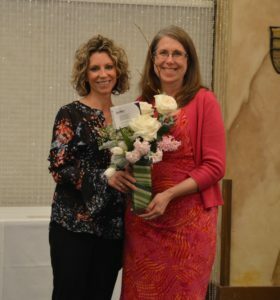 Girls on the Run – Cindy Brown nominated this charity who inspires girls to be joyful, healthy and confident using a fun, experience-based curriculum which creatively integrates running. 1,400 3rd-8th grade girls participated in their programs in 2016. 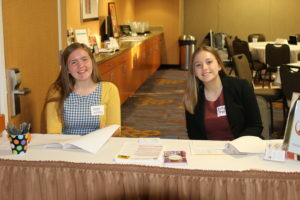 Teen Lifeline – Julie Krause nominated this nonprofit that provides a safe, confidential, and crucial crisis service where teens help teens make healthy decisions together. 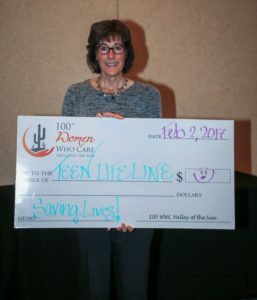 Their vision is to impact the devastating problem of teen suicide in Arizona so that any teen, at any time, will have knowledge of and access to Teen Lifeline, its counselors and services. St. Joseph the Worker – Jill Zimmerman explained how this organization’s mission is to assist homeless, low-income and other disadvantaged individuals in their efforts to become self-sufficient through quality employment. Rescue A Golden of AZ – Kristi Rivera shared how this nonprofit maintains a rescue program for displaced, mistreated or unwanted Golden Retrievers. They provide veterinary care, food and temporary shelter for the dogs with the goal of locating persons and families to provide permanent homes for these dogs. Trivium Prepartory Academy – Annann Hong nominated this school that offers a challenging yet rewarding curriculum to sixth graders through high school seniors who are willing to work hard and are willing to develop a deep appreciation for the true, the good, and the beautiful. She described how our donation would help fund their music program and provide needed supplies for music lessons. Spina Bifida Association of Arizona – Sharri Runnels explains how this charity promotes awareness of Spina Bifida and enhances the lives of those affected. Spina Bifida is the nation’s most common permanently disabling birth defect. It forms within the first several weeks after conception and its damage is irreversible. Most babies born with Spina Bifida will be lifelong wheelchair users and will experience approximately 20 or more non-elective surgeries. We learned that folic acid before and during pregnancy is key to preventing this birth defect. Make-A-Wish Arizona – Crissie Jameson is passionate about Make-A-Wish Arizona who grants the wishes of Arizona children, age 2.5 – 18 years, who have been diagnosed with a progressive, degenerative or malignant condition that has placed the child’s life in jeopardy. Last year, Make-A-Wish Arizona granted a record 365 wishes. God’s Garden Treasures provides beautiful flowers for our raffle each quarter. Karin Crawford, Owner, has a unique and creative approach we all love. She made special Valentine’s arrangements for us this quarter. Ashlee Murphy, Ahwatukee, and Jessica Walker, Scottsdale, took the lovely flowers home. Spread the word! Prescott, AZ just launched their chapter! Q2 meetings are May 2nd in Ahwatukee, May 3th in Scottsdale and May 4th in the West Valley. Register here. The charity nomination deadline is April 18th. 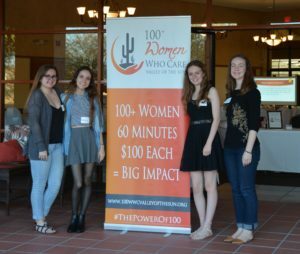 THANK YOU to Elena and our teen volunteers from Desert Vista HS, Pinnacle HS, Horizon HS and Trivium Prep! They did a great job! Q1 is complete! See you in May!